Cancellation policy for groups (9 and more people) demands 7 days advance notice, charging 50% of the entire stay in case of later notice and 100% in case of no show. We would ask for c/c details to make the preathurisation for 50% of the entire stay 2 weeks before arrival. It was my first stay at the hostel in Kyiv. I stayed there for the New Year and never regretted. It was best New Year Eve ever! The staff was very friendly, the atmosphere was great. The location of the hostel is superb. 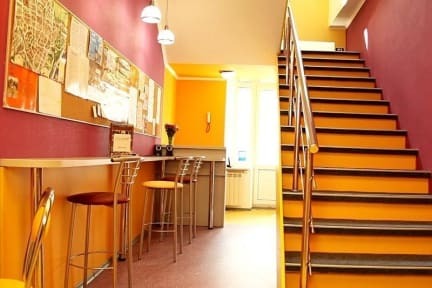 This hostel was much better than hostels I stayed at in Budapest, Bratislava and Vienna. I highly recommend this hostel if you are looking for a pleasant stay in the Kyiv centre. We were a group of Americans that stayed at this hostel for New Years weekend and it was perfect for our needs. It is very clean and is in a great location. There was a problem with the hot water, but that was quickly fixed. The staff was very friendly and helpful, especially Vlad! Vlad helped me with directions and gave me excellent suggestions for what to do and see, and if he didn't know the answer, he quickly found out the answer. Thank you, Vlad! Overall, this is a great place to stay. Nice hostel, conveniently well located, just a fair walk from the Maidana square. Plenty of good locations around the area. 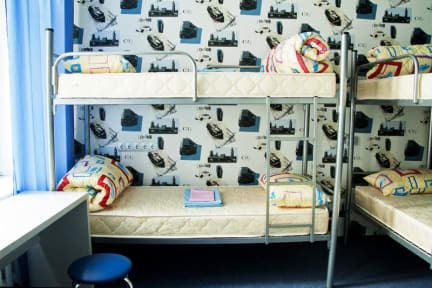 The hostel has great facilities and the staff is very helpful. A sure come back if I'm in town again. Perfect location, might be the cleanest hostel I've ever stayed. Reception lady was helpful but she should smile more. I felt like she hates me for no reason. Overall it is quite amazing. Would stay again. Not great. Was pretty disappointed given that this place had a 9/10 rating. For this price I know you're not expecting much, but lots of hostels around the world manage to be much more inviting for the same budget. The bathrooms stank of urine, and once they ran out of toilet paper it didn't seem to get replaced. They don't have towels, at all, not even for extra money. Rooms by reception are super loud. Definitely not terrible (I've stayed in much worse) but you can probably do better. Very bad. I would recommend it.